A quick notice for you in the NJ area tomorrow (10/24/10) – Jeff Brace and the gang at MARCH (Mid Atlantic Retro Computing Hobbyists) will be demonstrating Shredz64 at the NJ Science and Engineering Festival in Clifton, NJ. This is the second time Jeff and MARCH have been kind enough to show off our game and adapter, and it’s really appreciated. It looks like they’re going to have a lot of very cool technology at the festival, so be sure to check it out. It’s always a blast to see people enjoying the game – here are a couple of videos posted by some dedicated Shredz64 players. Win a Free PSX64 Interface and Help a Great Cause! The Synthetic Dreams Spooktacular Giveaway! 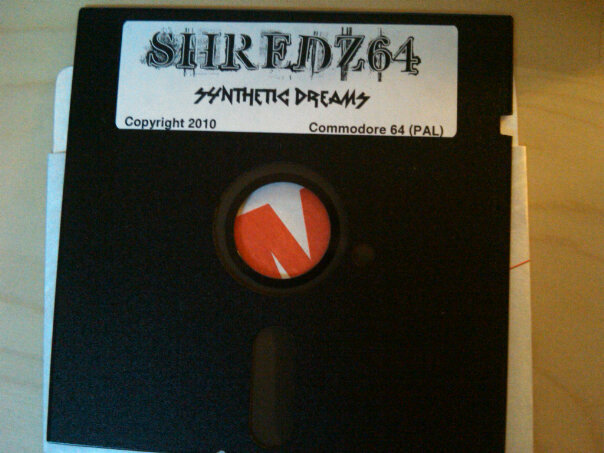 First, the prize: we’ll be giving away a free PSX64 Interface, along with a copy of Shredz64 to the lucky winner. Additionally, we’ll be donating $50.00 to one of the charities below – to which is by choice of the winner. Not only do you get to rock out to your favorite SID tunes Guitar Hero style and reinvigorate your old C64, Amiga, and Atari games with a Playstation controller – but you also get to help out those less fortunate who could really use a hand. Keep following along, and at midnight (EST) at October 31st, the winner will be announced. There are a lot of future scientists, doctors, and engineers waiting to soar, but they may never get the chance without food, medicine, or education. This blog, and Synthetic Dreams as a whole, is about letting people achieve their dreams – but before you can do that, you need your basic needs met – and sometimes you need a helping hand to meet them. Each of the charities above has been verified with Charity Navigator. Shredz64 – Check It Out at Maker Faire This Weekend! First off, before I make the plug – if you haven’t checked out MAKE or the Maker Faire before, you TOTALLY should. There are a lot of imaginative people with a ton of amazing, brilliant, or just plain zany creations. It’s very cool stuff. And speaking of Maker Faire – if you’re around NYC this weekend (Sept 25th and 26th), or are within driving distance, you’re in luck! The New York Hall of Science in Queens will be hosting this awesome event. Still on the fence? Well – time to hop off, because Jeff Brace and the gang at MARCH. (Mid Atlantic Retro Computing Hobbyists) will be demonstrating, amongst other retro goodness, Shredz64. If you haven’t tried it in person yet, now’s your chance. So enjoy the explosion of engineering this weekend, and get your retro on while you’re at it! Since no boards with the ATmega168 have been shipped out, this shouldn’t affect anyone, but if you happened to build your own board in the last few days and used firmware 1.1b for it – you’ll want to update it to 1.2b found here. The ATmega168 appears to access its flash memory at a different speed (perhaps due to increased size), which slowed down macro playback to a noticeable degree. This firmware updates the playback speed to put it back in line with the ATmega8. Again, this firmware is only for the ATmega168, so if you bought your board, you won’t need this firmware. For whatever reason, Digikey and Mouser’s supply of the Atmega8-16 MCU is completely out of stock. I’ve seen differing reports whether this chip is End-Of-Life’d, but that certainly seems like it might be the case – neither site indicates that a future stock will be available. With this in mind, all new PSX64s produced will be using the Atmega168 instead. Really, this will functionally make no difference. The 168 can run faster and has more memory, but I’m driving it with the same 16 MHz crystal and with the same code. And luckily, the two chips are pin compatible, so no rework of the PCB is necessary. The Atmega168 does have different fuses and slightly different architecture, and the firmware needed to be recompiled. I made a PSX64 with the ATmega168 tonight, and recompiled the firmware, and life is good. If you’re building a new board with an ATmega168, or (in the future) need to reflash your PSX64, the new revision B firmware is available here. (i.e. psx64fw11.hex is version 1.1 for the ATmega8, and psx64fw11b.hex is version 1.1 for the ATmega168). I decided to spruce up the hand written labels with a little MS Word mail merge label action. Not the fanciest in the world, but a little nicer looking! With Valve releasing Portal 2 fairly soon, and after realizing a SID version of “Still Alive (Portal Credits)” existed, I realized I had no choice but to make it a bonus track and post a video of it in action. This and all tracks are available at Synthetic Dreams. For those who want to download the NTSC or PAL version of Shredz64, I updated the disk images available online to include the latest track selection. Additionally, the link on the blog to the PSX64 firmware now points to version 1.1, the latest update which incorporates the macro and speed fixes. For archival purposes, I’ve left 1.0 and 1.0a in the download directory as well. Also, hopefully another new track soon, maybe even this weekend!